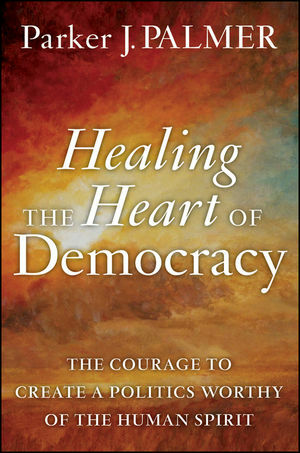 In Healing the Heart of Democracy, Parker J. Palmer quickens our instinct to seek the common good and gives us the tools to do it. This timely, courageous and practical work—intensely personal as well as political—is not about them, "those people" in Washington D.C., or in our state capitals, on whom we blame our political problems. It's about us, "We the People," and what we can do in everyday settings like families, neighborhoods, classrooms, congregations and workplaces to resist divide-and-conquer politics and restore a government "of the people, by the people, for the people." An appreciation of the value of "otherness"
Healing the Heart of Democracy is an eloquent and empowering call for "We the People" to reclaim our democracy. The online journal Democracy & Education called it "one of the most important books of the early 21st Century." And Publishers Weekly, in a Starred Review, said "This beautifully written book deserves a wide audience that will benefit from discussing it." Parker J. Palmer's writing speaks deeply to people in many walks of life. Author of nine books—including the bestsellers The Courage to Teach, Let Your Life Speak, and A Hidden Wholeness—Palmer is the founder of the Center for Courage & Renewal. His work has been recognized with ten honorary doctorates and many national awards, including the 2010 William Rainey Harper Award, previously won by Margaret Mead, Paulo Freire, and Elie Wiesel.